OPINION—A couple of weeks ago, my son, Courtland, said, “Hey, Dad, have you heard what Elon Musk is doing?” My first thought was that this was the opening of a joke. I had no idea what an Elon Musk was, or what it might be doing, but it sounded vaguely amusing. I don’t get out much. Elon Musk is not a kind of cologne. It’s a man’s name. As it turns out, Musk is the Big Cheese at Tesla, the company that makes the Tesla electric car. Which I think is kind of neat, although most people evidently don’t realize that the great majority of the electricity used in the U.S. is still generated by burning coal. So there’s that. But running Tesla isn’t all Elon Musk does. Don’t let his handle fool you. Sure, it sounds like the name of a villain’s character on a Saturday morning cartoon, but Musk is actually a very rich fellow. Besides heading Tesla, Musk owns a company called Boring. For some reason. Now, I had never heard of Musk, or Boring, before a couple of weeks ago, and I still have no idea what all Boring, or Musk, does, but I know one thing. 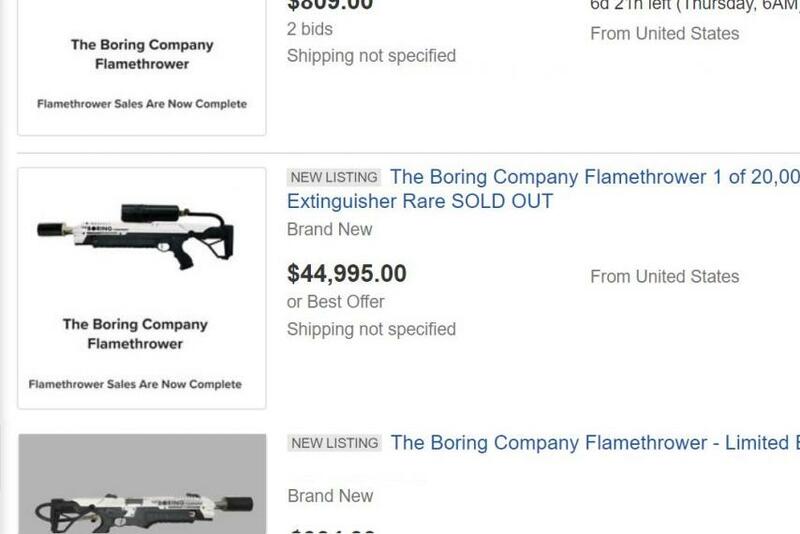 Musk, or Boring, has invented a flamethrower, and they’re selling faster than fried Oreos at the state fair. Or else they haven’t, and they’re not. It seems to depend on who you believe. Just after Christmas the Boring company announced, on social media, that they had a lot of flamethrowers lying around, and they’d be willing to part with them to the tune of $500 a pop, if anyone was interested. It seems a lot of people were interested. For some reason. Honestly, I like to shoot things, but I never really had much of a desire to own a flamethrower. Not that I don’t like fire. It’s pretty handy for, you know, cooking, and burning things. But it isn’t often I need to ignite something from a distance, so I usually use matches, or a lighter, when I decide to conflagrate. But you’d be surprised how many people saw Musk’s flamethrower announcement and immediately ordered one. As if they’d been sitting around for months and years and weeks, holding their heads, saying, “Why? Why can’t I purchase a grossly overpriced glorified charcoal lighter online and charge it to my almost-maxed-out Visa card?” People don’t get out much. After offering the flamethrowers for sale, Musk periodically updated his Twitter/Instagram/SnapChat/MyRichFace account, posting the latest totals of flamethrower sales. According to his running reports, Boring’s entire inventory of 20,000 units sold in little more than a week. Or else they didn’t. I’m still not clear on any of this. Above: Sold out flame throwers. The reason I’m vague is that no one seems to know whether Musk really has the flamethrowers, or if he was just playing a practical joke on 20,000 people with $500 worth of disposable cash and some unhealthy arsonistic tendencies. Some say the announcement was a hoax. Others say it was real. Still others are blaming George W. Bush. Personally, I have no idea. Musk posted a short video on Boring’s website, which showed him playing with one of the flamethrowers. It shot a pretty good tongue of fire about two feet. What a letdown. There was a bottle on top of the gun, maybe a propane bottle, which, according to my calculations, would last about five minutes. 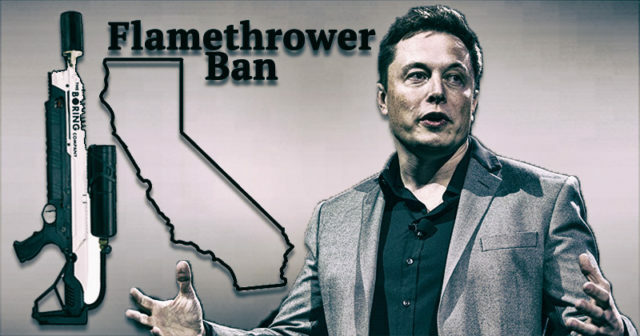 Even if Musk’s flamethrower is real, it’s pretty pathetic. The real ones, the ones used by soldiers in World War II movies, will shoot burning napalm about 50 feet. What Musk was using was basically a Bic ligher on steroids. It wouldn’t even make a good pear burner. Not that that has kept the Chicken Littles from raising the threat levels in their respective states from ‘What are we offended by today?’ to ‘Elon Musk is destroying the planet and must be stopped.’ Days after the announcement, LA California Assemblyman Miguel Santiago leapt into action to ban the toy, because of the obvious danger involved. New York Congresspeople Eliot Engel and Carolyn Maloney introduced H.R. 4901, which would limit the use of Musk’s invention to law enforcement officers. Maybe they think ‘firefight’ mean, you know, fire fight. Besides the fact these paragons of other peoples’ virtue don’t even know if the Boring flamethrower exists, they seem to be wholly ignorant of the fact that human beings have had easy access to fire for a pretty good little while now. Banning a new toy will hardly save the planet from incineration. So, in retrospect, Courtland’s question actually was the opening of a joke. I’m just not sure yet what the punchline is . . .